Good news, the new manuscript of Vérane Berger has been accepted for publication in Ecology! Congratulations to Vérane! We investigated the influence of female age on five reproductive traits and on the size-number trade-off from an extensive dataset spanning 20 years of study on free-ranging Alpine marmots. Offspring mass increased with female age, whereas litter size and reproductive allocation remained constant up to 10 years of age and declined thereafter. Although reproductive allocation declined, post-weaning juvenile survival and the size-number trade-off did not change markedly throughout a female’s lifetime. Senescence of annual reproductive success (i.e. the number of offspring surviving their first hibernation within a given litter) only resulted from senescence of litter size. The data were insufficient to determine whether the decrease in litter size with age was caused by declining litter size at birth, offspring pre-weaning survival, or both. 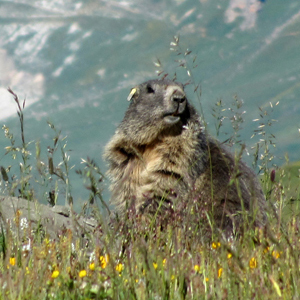 Regardless, our findings demonstrate that marmot females display a size-number trade-off invariant with age, and that their reproductive tactic involves increasing offspring size at the cost of decreasing litter size with increasing age. As a result, reproductive performance remains constant throughout a female’s lifetime despite the deleterious effects of senescence in litter size. This entry was posted on April 12, 2015 by marmotmarmota in Uncategorized.